It looks like Alexander Shlemenko will be the next man to challenge for the 185-pound Bellator title. Fighting in the main event of the card, Shlemenko defeated Kendall Grove in a wild, back-and-fourth scrap that had the Russian fighter in trouble at one point. 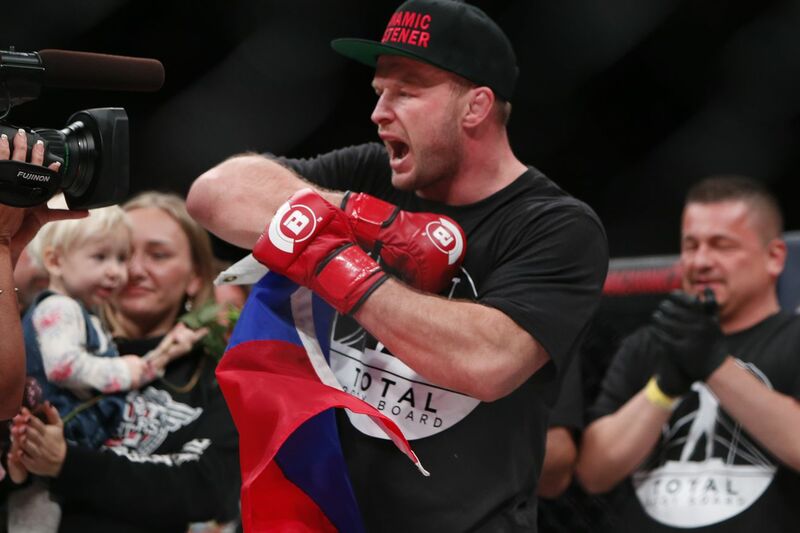 The 32-year-old Shlemenko caught the Hawaiian early in the fight, but going in for the kill Grove turned things around and caught Shlemenko with a well-timed hook, rocking the former Bellator champion. Grove then followed up with a series of punches and knees from the clinch, but it wasn’t enough to put away Shlemenko. For the rest of the round, both middleweights exchanged solid strikes in an even fight. Entering the second, Grove looked to stay away from brawling and stayed in the outside, utilizing his range. However, Shlemenko stalked Grove down and landed a left hook to liver followed by a right hook to Grove’s chin, causing the Hawaiian to fall to the canvas. Shlemenko raised his hands in victory and then followed up with ground-and-pound, forcing the referee to stop the fight. In the post-fight interview, Jimmy Smith asked Shlemenko on his thoughts on the title fight between champion Rafael Carvalho and Melvin Manhoef, and he’d like to fight the winner. “I think Melvin will win, and I will wait for Melvin, again,” Shlemenko replied to Smith. Shlemenko is now 53-9 as a professional fighter, and looks to gain what he lost in 2014 – the middleweight title. Additionally, Bobby Lashley faced Josh Appelt in the co-main event of the card, and it was another dominant performance for the former pro wrestler.